Although Dreicer competed with established high-end jewelers like Black, Ball & Co. and Tiffany & Co., he made the name Dreicer & Co. synonymous with exquisite jewelry. In 1885 he took his son, Michael, as a partner and changed the firm’s name to J. Dreicer & Son. That same year the father and son made a daring move. While the other jewelry retailers were doing business on Broadway, the Dreicers purchased the Wall mansion at No. 292 5th Avenue. The house was, as The Times remarked “in the heart of the fashionable residential section of New York City.” It was converted “into one of the finest business buildings on the avenue,” said the newspaper. From its 5th Avenue location Dreicer & Co. continued to nudge popular taste towards colored stones. “The father and the son are credited with having done much to overcome these prejudices and to have aided in creating in this country a taste for beautiful gems and exquisite art in jewelry,” said The Times. Yet the jewelers did not ignore pearls, either. One 30-inch string of perfectly matched pearls sold for $1.5 million—a record price. Single pearls sold for as high as $130,000 and the Duke of York Diamond was sold by the Dreicers for $125,000. In 1906 J. Dreicer & Son moved north again as exclusive businesses moved up 5th Avenue. The architectural firm of Warren & Wetmore was commissioned to design a building that, in terms of refinement and taste, would meld into the neighborhood. Completed later that year, the structure succeeded in doing just that. Nevertheless it would be the interiors that caught attention. 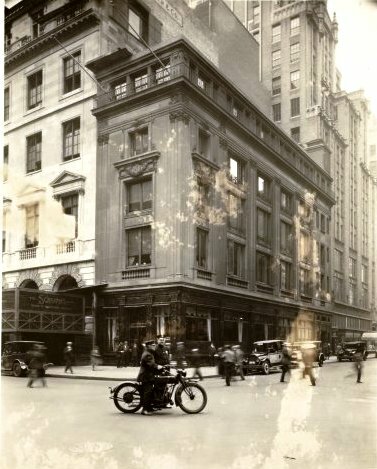 The well-heeled patrons who passed through the doors of Dreicer & Co. would find themselves in surroundings not unlike the parlors and drawings rooms of the wealthiest 5th Avenue residents. 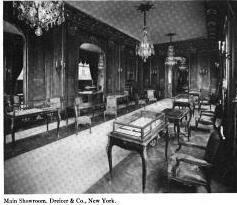 Nelson of Paris who was simultaneously constructing the interiors of the Cornelius Vanderbilt mansion, was given the job of constructing the showrooms. French paneling and mirrors, gilded molding and imported hardware were installed. 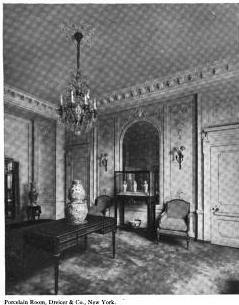 Then decorating firm P. W. French & Co. brought in the period furniture to complete the setting. “There are costly cartonniers of rosewood, chairs and divans of natural French walnut, hand carved, fitted with silks of original design, chandeliers of fire gilt bronze, hung with great crystals, and walls paneled in hand-carved walnut, with capitals and ornamentation of gilt. Mirrors make for the eye an apparently endless gallery,” reported Men’s Wear. By 1909 the blocks around Dreicer & Co. were filled with the most exclusive jewelers and other retailers in the country. 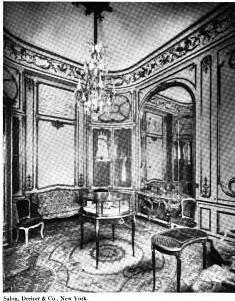 On November 1 of that year the Paris jeweler Pierre Cartier opened his American branch on the 4th Floor of No. 712 5th Avenue. Cartier historian Hans Nadelhoffer remarked nearly a century later that Dreicer was the “most feared” of Cartier’s competitors. Before the French jeweler could import his latest designs, Dreicer had already copied them and had its versions on display. In the wake of the robbery-murder, four reporters from the New York Tribune walked into Dreicer & Co. to interview the manager about the security precautions the store was taking. “When they entered they observed a group of muscular youths ranged in a careless semi-circle in the rear. The conversation between the manager and the reporters, who were grouped about him, had hardly got under way when the semi-circle began to narrow and creep closer. No one could have moved without being covered,” said The Tribune on December 18. The human security system apparently worked for Dreicer & Co. was not targeted during the stream of robberies. The business went on for a few years, but without Jacob and Michael, the spirit of J. Dreicer & Son was gone. It was their combined expertise that formed the essence of the firm. “Both father and sons were noted for their expert knowledge of jewels and for their care in arranging them so as best to present their beauty,” said The Times. The Times went on to say that “The building of Dreicer & Co., regarded as one of the most beautiful on Fifth Avenue, has been sold to the Northern Pacific Railway Company.” Cartier, who once regarded Dreicer as its most feared competitor, purchased the entire stock of jewels for $2.5 million. Expansive window openings were later cut into the 5th Avenue façade, but on the whole Warren & Wetmore’s refined French exterior is essentially intact. Even the gold-grained black marble street level remains—an astonishing feat of urban survival. Today a tourist shop called Cute Souvenirs sells t-shirts and coffee mugs in the space once decorated in Louis XV paneling where baronesses and millionaires shopped for baubles. It is a testament to the ever-changing 5th Avenue. many thanks to reader Marion van der Fluit in Amsterdam for requesting this post.